Hotel Esencia is a majestic 50-acre estate at the midpoint between Tulum and Playa del Carmen in Mexico. It has long enjoyed a storied past in this ancestral cradle of culture, cuisine, and comfort. Originally built as the private hideaway home of an Italian duchess on the most beautiful beach of the Mayan Riviera, it later became a hotel, and, for some time, has been a sought after destination for honeymooners seduced by the serene comforts of this timeless mansion. A new chapter began in 2014 with the arrival of a new owner and a bold, worldly outlook on how to savor paradise. The estate’s provenance as a place of leisure for nobility is the guiding inspiration for a modern reimagining. The Main House remains the hotel’s centerpiece, around which footpaths lead to only 38 suites and 3 villas where guests enjoy genuine privacy and top flight hospitality. Ideally situated far from huge resorts and the roar of pleasure boats, the immaculate bay of Xpu-Ha is a natural haven where each year sea turtles make their nests. Hotel Esencia invites the happy few who know how rare it is to find a place that is truly unique, to make it their home in the tropics. 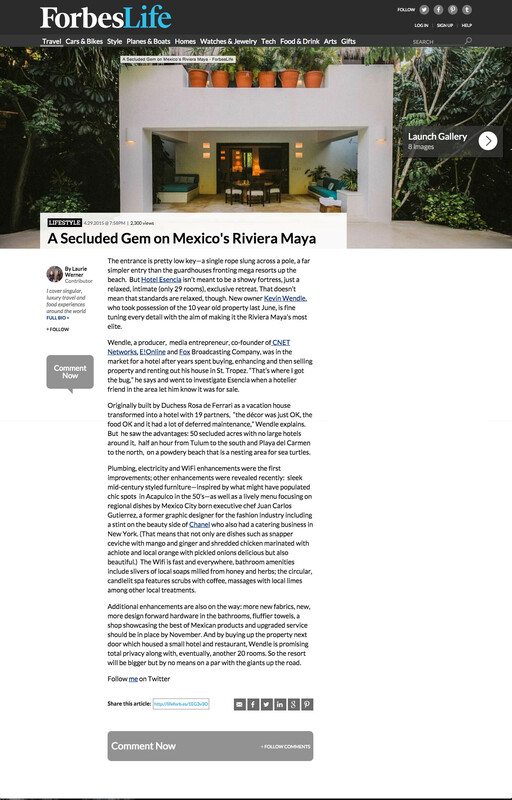 "In addition to not putting a sign at the entrance, current owner Kevin Wendle chose a property on the most beautiful stretch of beach, talcum powder and heavenly, without neighbors on the whole coast, and furnished it in a 'Mad Men meets Peggy Guggenheim' style"
"Escape to Esencia: Honeymooning at the Riviera Maya's most exclusive hotel"
"A beloved hideaway on Xpu Ha beach, Hotel Esencia is lauded for its refined charm and tucked-away location"
'Sound Stylist' Michel Gaubert's favorite Hotel - "The mood is mellow and the staff great - feels like staying in someone's house"
"On a pristine white-sand beach and ringed by Mayan jungle, Hotel Esencia is an art-lover's paradise"
"The best 50 beach honeymoon destinations"
"11 new Beach and Jungle suites this season in the perfect stretch of beach"
Linda Fargo's BG Radar - A very special hideaway "It's not just about the calm beach, thatched huts and lush tropical garden bungalows but the decor and the design"
"Stay in a new beach suite and you can fall straight out of bed and onto the icing-sugar sand, or gaze over the water from your terrace"
"One of my favorite places is Hotel Esencia - it ticks all the boxes, including a gorgeous beach"
"This is how luxury should be - barefoot, leave-your-doors-unlocked, and inhibition free"
"For tastemakers…Esencia is the only choice"
"A secluded gem on a powdery beach that is a nesting area for sea turtles"
"The most heavenly hotel on Earth"
"Here, on one of the most beautiful stretches of the Riviera Maya we came to chill. And luckily for us, we found just the spot to do it: Hotel Esencia. 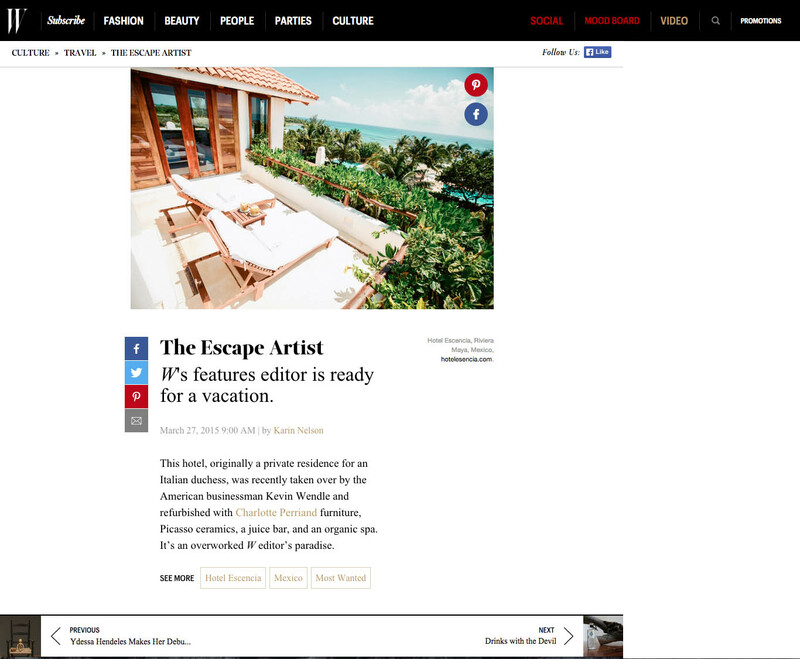 Irresistibly charming..."
"An increasingly chic retreat on the Caribbean coast"
"Even at capacity, one seldom notices other guests. It’s the supremely intimate ambiance and the naturally serene environs that set you at ease and ultimately convince you that the place is all yours"
"In short, this place is heaven"
"The place is nothing short of perfect"